History | Educational Group E.G. Stratigakis S.A.
1978 E.G. STRATEGAKIS S.A. is established in Thessaloniki by Efstratios Strategakis, continuing his many years of experience already gained in the field of foreign language education. The development of the Network of Foreign Language Centres in Northern Greece is initiated. 1988 Independent Computing Courses for children and adults are introduced. 1989 CITY LIBERAL STUDIES, a pioneering Educational Institution in the field of private tertiary education enrolls its first students. 1990 Plans for the expansion of educational activities in the Balkan region begin. 1991 The first PHAROS Foreign Language Centre commences operation in Bulgaria. 1993 After a two-year accreditation period, CITY LIBERAL STUDIES officially commences its affiliation with the University of Sheffield, U.K.
1996 The first INTERNATIONAL LANGUAGE CENTRE commences operation in Albania. 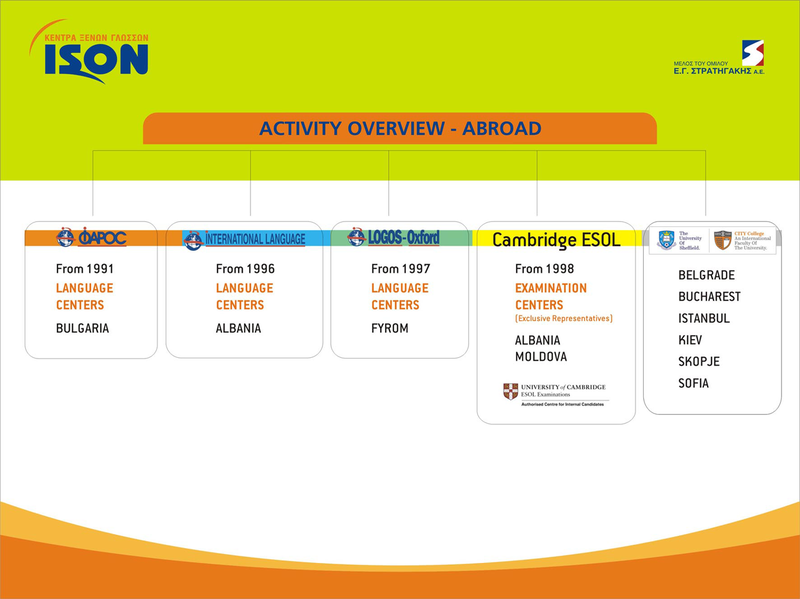 1997 The first LOGOS OXFORD Foreign Language Centre commences operation in FYROM. 1998 THESSALONIKI INTERNATIONAL LIBRARY (THIL), the largest foreign language library in the city, with 30,000 titles, welcomes its first members. 1998 Exclusive representation of CAMBRIDGE ESOL examinations in Albania and Moldova begins. 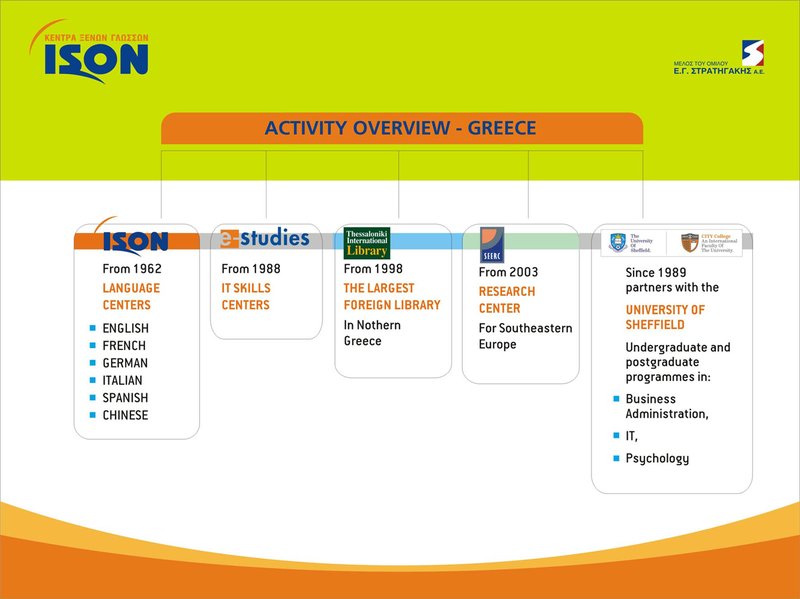 2001 The services provided by the STRATEGAKIS Group are re-grouped and the Foreign Language Centres are now named ISON and Information Technology Centres are named e-studies. 2002 5 authorized ECDL Examination Centres are established. 2003 SEERC (South Eastern European Research Centre), a non-profit organization, is established for the promotion of research in socio-economic sciences in the south-eastern European region. 2004 ISON Foreign Language Centres become authorized CAMBRIDGE ESOL Examination Centres for internal candidates. 2005 CITY COLLEGE operates its Executive MBA Programme in Belgrade, Serbia. 2006 CITY COLLEGE operates its Executive MBA Programme in Bucharest, Rumania. 2006 The expansion of the network through franchising commences in Southern Greece, Athens and Patra. 2011 The University of Sheffield has been named University of the Year in the 2011 by Times Higher Education Awards.